Three area residents saw life in a new light after being randomly selected to receive a pair of EnChroma’s new Cx Lenses as part of its nationwide Color for All Campaign. 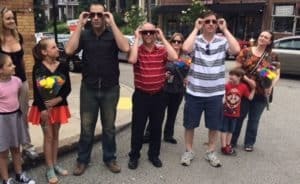 Our Squirrel Hill location was buzzing with activity on June 3 with local media arriving to document the reveal party. One in 12 men and 1 in 200 women are afflicted with red-green colorblindness, which is caused by a gene substitution on the X-chromosome. Rarely do those afflicted see everything in black and white, but rather, it’s a confusion of colors including blue vs. purple, pink vs. gray, red vs. orange, orange vs. green, green vs. brown, and red. vs. brown. “I’m hoping to end all the confusion I’ve had for so many years,” added Mark Eidemiller. EnChroma uses a special filter technology in its lenses to separate red and green wavelengths so patients are able to distinguish between colors. After trying on their new glasses, the verdict was unanimous. “Everything is so much prettier,” said Arpad Sooky. Eyetique is the first retailer to carry the EnChroma brand, one of 30 select retailers around the world. We carry both sunglass and prescription lenses for men, women, and children in a variety of styles and sizes. 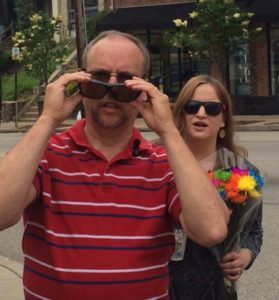 If you or someone you love is afflicted with color blindness, schedule an appointment today at one of the following locations: South Hills Village, Monroeville/Wilkins, Wexford, or Robinson.